Key developments in the week of November 25th include the large military operations in Nigeria and Sudan, the insecurity in the DRC and Chad, and the continued government intimidation campaigns launched in Angola. There were notable military operations in Nigeria and in Sudan last week. In Nigeria, with the February 2019 presidential elections nearing, the government is under increased pressure to tackle insecurity in the country. Last week, the security forces launched new operations against “bandits” and cattle rustler camps in the Mahanga forest in Zamfara state. At least 104 suspects and one police officer were reported killed, 50 hideouts destroyed and over 500 cattle recovered. In Sudan, intermittent clashes between the Rapid Support Forces (RSF) branch of the military and the Sudan Liberation Movement/Army (Abdul Wahid al-Nur Faction) (SLA-AW) continue in southern Jebel Marra. Fighting between the government and SLA-AW escalated in 2018 to pressure the group into joining the national peace process, but whilst contained geographically, the group maintains important operational capabilities. Last week, SLA-AW claimed to have repulsed a 400 men-strong RSF attack on their positions in the Feina area, leaving 18 RSF soldiers killed and another 18 wounded. They also accused the RSF of burning farmlands in the area in retaliation, a practice commonly observed in previous RSF anti-insurgent campaigns. Further fighting is anticipated in the next months as the RSF Commander early November vowed to “crush” the rebels by February 2019. In the Democratic Republic of Congo (DRC), security continues to deteriorate, posing a grave threat to the ongoing response to the most severe Ebola outbreak the country has faced and to the holding of free and fair elections at the end of December. In North Kivu, the joint Congolese and MONUSCO operations against rebels of the Allied Democratic Forces (ADF) continue to face staunch resistance. The ADF is seeking to discredit the government’s response to the threat they pose by repeatedly attacking large towns like Oicha and Beni. On November 26th, the militants killed six people in Oicha town before being repelled by the Congolese troops. On the 30th, their planned attack on Beni town was countered by Congolese and UN soldiers. Violence also rose further north last week, along the shores of Lake Albert in Ituri. At least three soldiers and three civilians were reportedly killed in attacks on military outposts in the Mahagi territory by militiamen from Djugu territory. 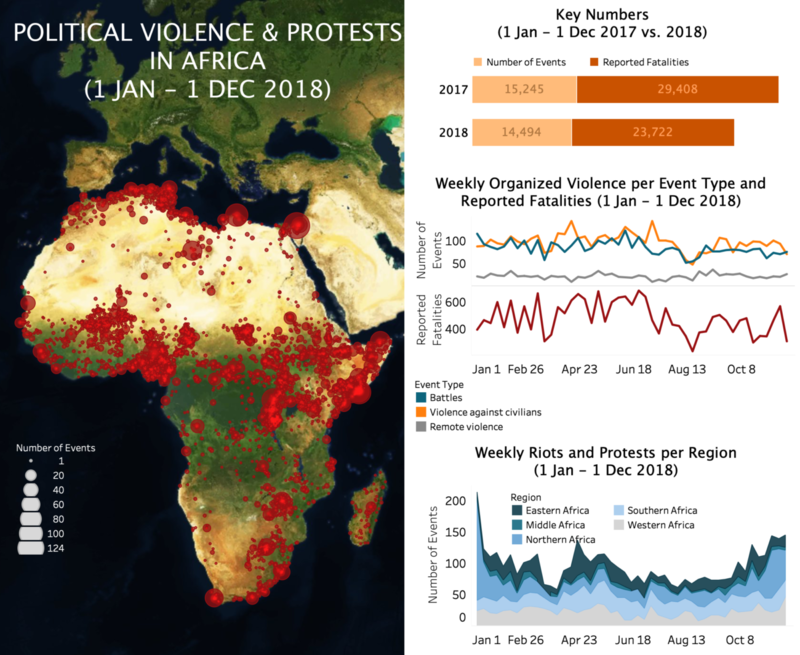 Organised armed violence in Ituri in 2018 is (so far) 1.5 times higher than in 2017, partly due to the resumption of violence between the Lendu and Hema communities in Djugu territory and to the continued rebellion of the Front for Patriotic Resistance of Ituri (FRPI) in Irumu. In Chad, the situation is tense in the Tibesti and Ouaddai regions. In Tibesti, the state forces have been battling armed local self-defence groups in Miski since October 29th, allegedly over contested territorial boundaries and planned gold extraction benefiting the regime of Idriss Deby. Although it remains unclear if these local militias have any links with the rebels of the Military Command Council for the Salvation of the Republic (CCMSR) present in the area, the situation could escalate quickly. The CCMSR has fought the state forces close to Miski on four occasions since August already, and the army has retaliated with airstrikes on villages like Yebbi-Bou, from where the Miski militias are said to have emerged. Violence also rose mid-November between Arab herders and Maba farmers in the Ouara department of Ouaddai, a regular occurrence in the farming region. At least 16 people were reportedly killed in five days of violence in the Chechan area between November 17th-22nd. Lastly, in Angola, intimidation by the authorities continues in the diamond-rich Lunda Norte province. On November 24th, military and police forces carried out house-to-house raids in the town of Cafunfo, beating some people up, looting their belongings, arresting 700 people unable to present identity cards and expelling around 50 identified as Congolese. The raids came amidst a security crackdown on illegal diamond mining in the province since end September, which escalated into violence early October and resulted in the forced repatriation or fleeing of over 400,000 people, mostly from the DRC. The raids also came a week after the resurgence of the Lunda-Chokwe protectorate movement, whose supporters protested in Cafunfo on November 14th to call for the autonomy of the “Lunda kingdom”. The authorities responded violently to the protest, firing live shots and beating the protesters. The last protests by the group in Lunda Norte on February 24th were similarly repressed, resulting in one fatality.